What is cattle handling all about? A heavy coat insulates against a harsh climate and reduces the need to develop excess back fat. 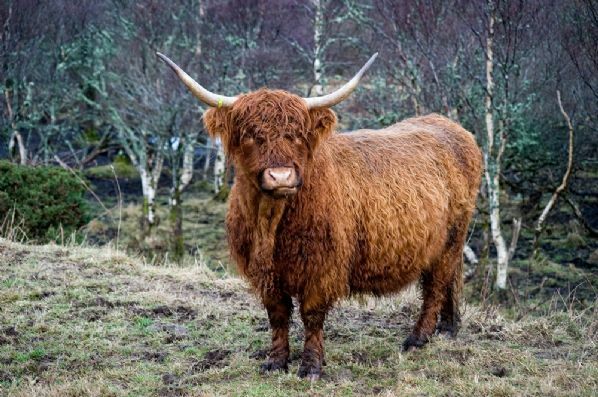 Recent studies in both North America and the UK have shown that Highland Beef is consistently much lower in fat content and cholesterol than other breeds. It is so lean that it compares with chicken and fish fat content. The marbling of the beef gives the same tenderness and tastiness as the other larger breeds. Studies in the US have verified that Highland Beef is 38% lower in fat content and 4% lower in cholesterol than steaks from local supermarkets. Scottish Agricultural College, Dept. of Food Science and Technology published by McCance & Widdowson, Ministry of Agriculture, Fisheries and Food. What breeds are suitable for crofting? Use - beef, dairy or dual? Suitability to overwintering – consideration to the facilities that are available for overwintering animals, such as shed/barn for housing or whether the animals are to remain outside. • Shetland – dual (Viking breed, small and therefore low impact on the ground, grow a woolly coat for the winter and so are very hardy and not requiring winter housing, excellent foragers and efficient convertors requiring little or no additional concentrates, finish off grass within 30 months, good mothers, long lived, calm and easy to handle). The Scottish Government published its Beef 2020 Report in August 2014, detailing the current picture for beef production in Scotland and its vision for the beef industry in the future. Animal Health and Welfare links from the Scottish Government, including Livestock ID and Traceability. Animal Welfare and Wellbeing Charter from Quality Meat Scotland (QMS). Compassion in World Farming – About Cows. Livestock Transport Book from QMS – ‘an information package for drivers involved in the transport of all farm livestock’. Code of Practice for the Welfare of Cattle (2012), from the Scottish Government. A series of health-related Factsheets by XLVets. A comprehensive Cattle Disease Guide from the Cattle Site. Current guidance (last updated 9 April 2015) on keeping cattle in Great Britain (the Cattle Keeper’s Handbook) from the UK Government. A useful summary of current (2017) legislation for Cattle Movement and Tagging. This scheme, supported by the Scottish Government, is 'open to groups of at least two crofters within the crofting areas, providing high health bulls in areas where ownership and commercial hiring are uneconomic'. Corry Meadow is a local business at Tighnaneun, Croft 62a, Rogart, Sutherland. It is ‘being run by a bunch of excited new entrants. We keep shetland cattle, hebridean sheep and a mix of poultry’. Their Facebook page keeps interested parties up to date with their activities. Scottish Crofting Enterprise is run by the Scottish Crofting Federation and is a directory of active crofters who offer a variety of food for sale.